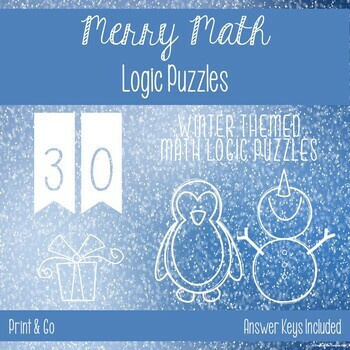 Kids love puzzles, and these winter themed logic puzzles are a great early finisher and/or enrichment activity for your high flyers! They are also a FUN way for students to strengthen their reasoning abilities while practicing math facts! You can increase the difficulty level by requiring students to identify the value of each object or having students explain how they solved the puzzles. 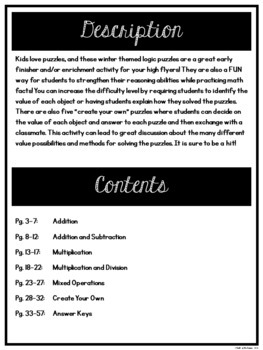 There are also five “create your own” puzzles where students can decide on the value of each object and answer to each puzzle and then exchange with a classmate. 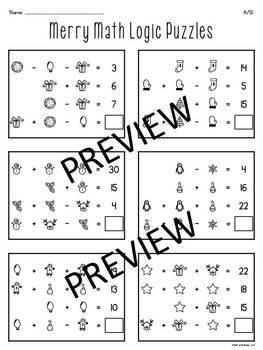 This activity can lead to great discussion about the many different value possibilities and methods for solving the puzzles. It is sure to be a hit! 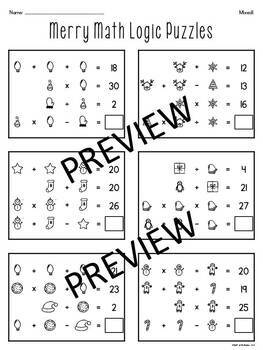 If you and your students enjoy these puzzles, please check back soon for puzzles for other seasons and holidays!